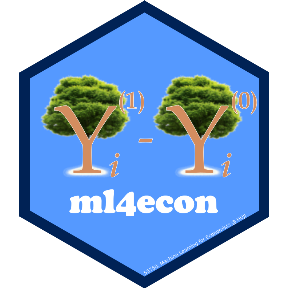 Welcome to the unofficial ml4econ, the Machine Learning for Economists course repository! This is a GitHub repository for a graduate level course taught by Itamar Caspi and Ariel Mansura. The official 55750 syllabus and the content on the official 55750 Moodle website shall always prevail in case of any discrepancy or inconsistency between this website and its official HUJI versions. This website and its content do not necessarily reflect the views of the Bank of Israel or any of its staff. The course will cover topics that range between machine learning (ML) and econometrics. In particular, we will discuss concepts from the world of ML that can potentially contribute to empirical economics. The course will cover leading machine learning (supervised and unsupervised) methods, with an emphasis on the challenges and opportunities of integrating these methods in empirical economics, and the relevance of ML to policy analysis and causal inference. The various topics are illustrated through applications, reading empirical articles, and doing applied work. The first, part of the course will introduce you to Supervised (predictive) and Unsupervised Machine Learning methods. Examples include Regression and K Nearest Neighbors, Classification, Dimensionality Reduction, Decision Trees and Random Forests, Principal Component Analysis and Clustering Analysis. You will learn what techniques to apply and why. The second and biggest part of the class, will focus on the relationship between Machine Learning and Econometrics. You will learn about the difference between predicting and explaining, how machine learning methods aid in estimating treatment effects in high-dimensional settings, and how unsupervised learning method can help us to reduce dimenssionality and generate new variables. Examples include Causal Trees and Forests, Double Robust Machine Learning, and Text Mining with applications to data sets used to study economic phenomena. Though we will provide a brief introduction to R, RStudio, Git and GitHub, the focus of the class will be on teaching concepts rather than how to use R.
We do encourage you to try out other programming languages (especially Python). However, note that we will be able to provide limited support for languages other than R.
No programming background is necessary, though it will definitely come in handy. For those without programming background, and those interested in enhancing their coding skills, don’t worry! We will provide you with free access to DataCamp’s online courses via our special DataCamp Classroom account. We also strongly recommend you visit Grant McDermott’s amazing course, “Data Science for Economists”, that complements our course (and does way more than that!). Google and StackExchange are typically the first places to look for answers for computational related questions. It is safe to always assume that you are not the first one to encounter your problem. Nevertheless, we will also be using a private GitHub repository for class discussion. Please post there any questions or requests you may have that are relevant to all course participants, rather than emailing us. All of your classmates will benefit from the public discussions. You can access our GitHub discussion repository here, but before you do, make sure that you have created a GitHub account (see instruction here) and that you have received a collaboration invitations from me (Itamar). Shoot me an email if you haven’t received an invitation. Occasionally Itamar will post related stuff on twitter under the hashtag #ml4econ. Your feedback is important! Please feel free to share with us your comments, concerns and suggestions on the course in person or by email. A website created by Itamar Caspi using RMarkdown. Disclaimers: (1) The official syllabus and the content on the official Moodle website shall always prevail in case of any discrepancy or inconsistency between this website and its official HUJI versions; (2) This website and its content do not necessarily reflect the views of the Bank of Israel or any of its staff.